Those of you who picked up and read The Sunday Times this weekend may have noticed our name pop up in there. We are thrilled to announce our place amongst the UK’s 250 top performing mid-market private companies. Our first time listed saw us ranked at 163rd, almost halfway, however, we were just beaten by some incredibly tough competition for those few places. Since 1997, The Sunday Times Fast Track 250 league table, sponsored by Grant Thornton, has been building a database of the UK’s best performing private companies and entrepreneurs. Fast Track is the leading research company focusing on these top private UK companies which aid in the creation of jobs, wealth, and innovation. With only a handful of oil and fuel distributors within the list, Mark Andrews, Sales Director at Crown Oil commented: “We are very honoured to have been selected as one of the UK’s top 250 mid-market private companies. This is a major triumph for Crown Oil and a testament to our efforts over the last few years. Next year, we’ll be looking to improve our position and hopefully, finish in the top half of the league table”. The results are based on the financial year end for August 2013. With just under £190 million in sales, we took our place above builder and property developer The Emerson Group, and Pentagon Freight, which is an International freight forwarder. 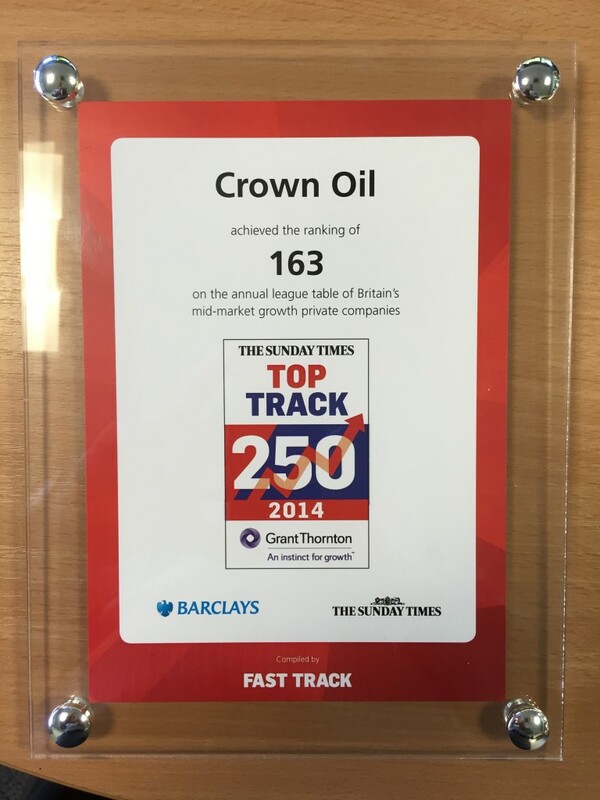 The Sunday Times Top Track 250 award is a huge achievement and compliment to everybody at Crown Oil. Not only does this serve as an excellent benchmark for next year but, it is something which rewards all of the hard work which has been put in by all of our staff over the last year.